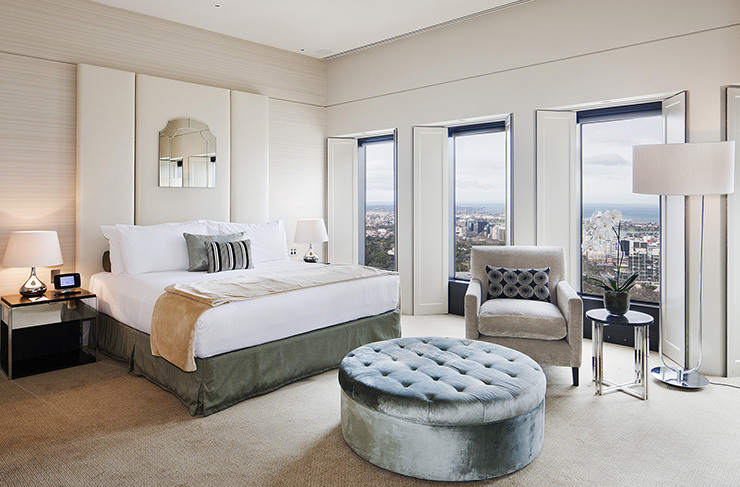 To be honest, we’re always looking for an excuse for a staycay in one of Melbourne’s best hotels. Birthday? Book a suite. Nephew walked for the first time? I’m already calling the Sofitel. Found $10 on the ground? Let’s party. Of course there are a few ways you can go with Melbourne hotels: from the boutique to the bodacious. Staying in Crown Towers is something every Melbournian should probably do once in their lives, but there are plenty of other good hotels on the market. These are just some of our favourites. Get ready to raid the minibar and steal some bathrobes. These are the best hotels in Melbourne. Start with the obvious, right? Now some people think Crown is reserved for Japanese high-rolling businessmen, or maybe Roger Federer. But anyone can stay here—in fact the room rates aren’t as exorbitant as you might expect (don’t get us wrong, it’s still a splurge, but you won’t have to remortgage the house for that Deluxe King. As with all Crown hotels, you get free WIFI, luxe fittings, epic views over Southbank and the CBD, plus some of the city’s swankiest restaurants right under your feet. We recommend any of Spice Temple, Rockpool or Long Chim. We’ve got a soft spot for The Sofitel. Every time we get greeted with a ‘Bonjour!’ at the check-in desk, we know we’re in for a VERY good night. The Sofitel has a few claims to Melbourne fame. It’s arguably got the most beautiful lobby space of any hotel in the CBD, it’s got The Mayfair downstairs (a gorgeous late-night champagne & oyster bar), and because of its location at the top of Collins St, the corner rooms have insanely good views, looking east toward the Dandenong Ranges. Proper ‘everything the light touches’ kind of views. You can even enjoy them at the well-stocked breakfast buffet at No35 Restaurant. If we’re talking pure location, it’s hard to go past Doubletree By Hilton. You’re about 50m from Flinders St Station (most of the rooms come with beautiful statin views), and our favourite laneway is just around the corner—Centre Place. Home to Aix Creperie Salon, Jungle Juice, Hells Kitchen and The Soup Place. The room fittings are lavish, as you might expect when they whack the ‘Hilton’ name on the door, but they do verge on the corporate end of the scale (don’t expect the same level of quirk as, say, The Arts Series hotels). If you’re looking for dinner, you could do worse than grab a bite at Doubletree’s elegant, Platform 270. Melbourne’s brand new Novotel Hotel in South Wharf is an interesting one. Some Melbournians will say you’re better off staying in the CBD (or even Southbank) because they’re closer to the action. 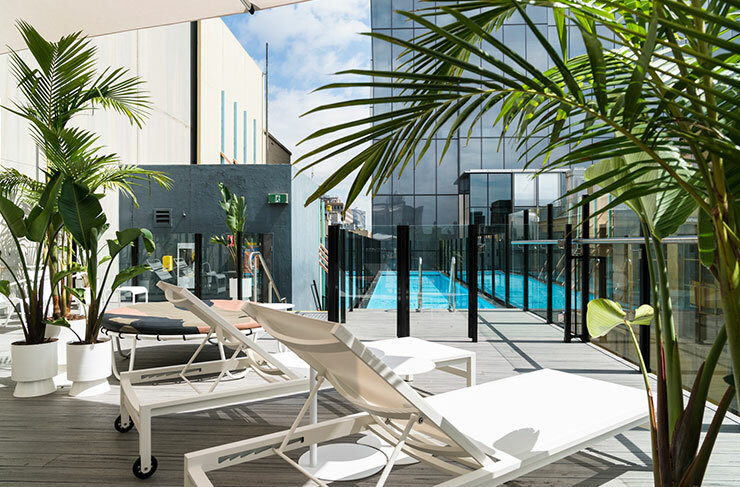 But if you’re coming to Melbourne for an event at the Convention Centre (AKA Jeff’s Shed), business in Docklands, shopping at DFO, or you just want to check out South Melbourne Market, The Novotel is actually perfect. And the hotel itself is stunning: it cost $150m to build, Woods Bagot, NH Architecture Fender Katsalidis handled the architectural plans, and the rooms all come with cutting-edge amenities and views of the CBD. Pro tip: if you ceebs leaving the building, check out Mr Carpono Bar & Dining on Lvl 6. Very underrated Italian. If you’re after old-world elegance, nothing touches Hotel Windsor. 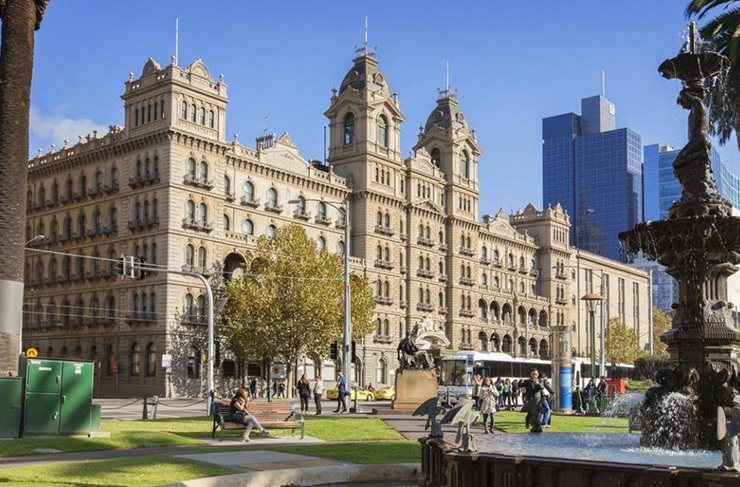 It’s literally Australia’s only surviving grand Victorian-era hotel, the spot where the Constitution Of Australia was drafted in 1898, a proper relic of the 19th century—although relic may be a bit uncharitable when you see the opulent interior. The Windsor underwent a significant renno back in 2015, polishing the old girl and giving her a face-lift. Today, its 180 rooms are absolutely impeccable: stately, grand, slightly OTT (fussy sleepers even get a pillow menu). It’s about as close as most people are going to get to something like The Ritz in London. The good news is—you won’t be paying Ritz prices. Standard rooms start at $249 per night, mid-week. It’s still hefty, but something everyone should do at least once in their lives if only to say they’ve stayed in a little slice of Australian history. Two words: free minibar. Yup, Ovolo Laneways runs free minibar in all its rooms, right down to the Studio rooms. And unlike a lot of CBD hotels, they don’t take themselves too seriously. There’s a free lolly bar in the lobby, a pinball machine in the Penthouse Suite (highly recommend this room for Hen’s Nights etc—there’s a hot tub on your own private balcony) and they even run ‘Break Up Packs’ for the newly single. They tend to include a lot of chocolate and facial masks. There’s no in-hotel restaurant per say, but we always just get UberEATS delivered straight to the door. Easy. South Yarra’s Arts Series gem. The Olsen has been going strong for years now, wowing international guests with its epic John Olsen art collection, cantilevered swimming pool and quirky amenities (you can hire microscopic SmartCars and Lekker bikes if you feel like stretching your legs). The Olsen is one of those hotels you barely need to leave: Spoonbill does an excellent brunch (or there’s always Smak just down Daly St), you’ve got the Norbu Day Spa for pamper sessions, and the whole Chapel St shopping precinct right on your doorstep. If it’s a fancy anniversary staycay, book in one of the private spa suites. They’re worth the extra mullah. One last tip? Stay in and order a Rowdy Double Cheeseburger from Two Wrongs, just downstairs. One of our favourite burgers in Melbourne. The Chen is The Arts Series’ newest child. And like all new children, they tend to get attention lavished on them from an early age. 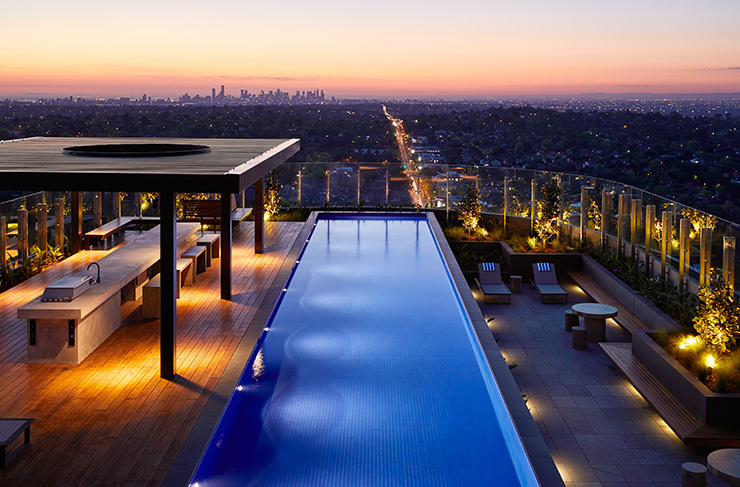 That’s why The Chen picked up probably the most jaw-dropping swimming pool in all of Melbourne. It’s on the roof (just ride the elevator till it won’t go no higher) with wraparound views of Melbourne CBD, the Bay and the Dandenong Ranges. One of the advantages of being out in Box Hill (apart from the food) is that there’s hardly anything to obstruct your view. High rises are still a novelty out here, so The Chen gets the skyline to itself. The rooms are gorgeous, as you’d expect, and there’s a cracking cafe just downstairs: Whitehorse Chloe. If you have a sweet tooth then this boutique hotel is for you. The Adelphi is located in the heart of the Flinders Lane shopping and dining precinct (literally the best restaurants in town are all within 100m of your front door). This makes it one of the best spots for visiting foodies. The hotel itself is filled with good vibes, friendly staff and funky décor. And even better, it comes with Om Nom Dessert Bar, just downstairs—Melbourne’s premier dessert and cocktail temple. Imagine Willy Wonka was given a large budget and told ‘Use your imagination...’ Om Nom is hat he would build. While you’re staying at Adelphi, make sure to check out the famous rooftop pool and deck area, swing on swinging couches in the foyer and watch endless movies with snacks from the free mini bar. Our top pick for classy couples. You wouldn’t expect to find The Prince Hotel above The Prince Of Wales public bar. One’s a slightly sticky (but awesome) live music venue and brewpub. The other’s a swanky, designer hotel, perched high above the corner of Fitzroy St and Acland St. If you’re looking for a comfy bed that’s close to St Kilda Beach, Luna Park and Albert Park (can you say Grand Prix adjacent?) The Prince is probably your best bet. The rooms look like something off a Pinterest board, but it’s the foodie experience that really seals the deal. The Prince has the award-winning Circa restaurant, with Rhys Blackley running the pass. Plus it’s got The Deck—a rooftop cocktail lounge overlooking Port Phillip Bay. Round out the weekend with a pamper pack at the in-house Aurora Spa. 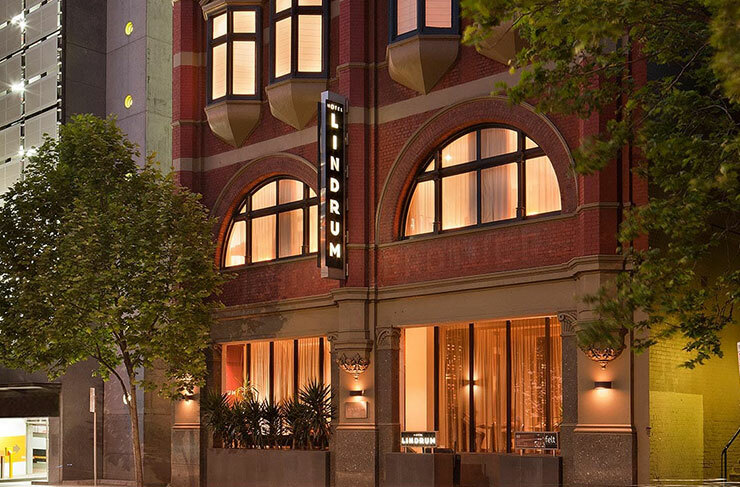 QT quickly made a name for itself as one of Melbourne’s most beautiful CBD hotels. There’s a few things going for it: it’s a short stroll from the Collins St, shopping precinct, there’s plenty of A-Grade restaurants and bars in the building (including a cafe, rooftop bar, laneway concept bar and meaty grill restaurant), and all rooms come with free WIFI as standard. Even the budget rooms are decked out the nines: wooden floorboards, his and her sinks, gel-topped beds, free in-room movies and coffee pods (nice touch). When it comes time to eat, just pick your poison: Rooftop At QV for views and cocktails, then dinner at Pascale (probably the best hotel restaurant going around). Wake up with a petit gateaux and strong latte at The Cake Shop. Pure staycay bliss. Melbourne’s Jasper Hotel probably doesn’t reach the luxurious heights of your Crown or Doubletree (technically it’s a 4-star hotel), but the location near Queen Vic Market is excellent, and it’s a little easier on the hip pocket than some of the other boutique stays on this list. There’s 90 contemporary rooms and suites at Jasper, each one designed to represent a different facet and colour of the Jasper gemstone. The whole place got an extensive renovation in 2014, so you can expect modern styling (we hesitate to use the word ‘funky’, but what the hell—it’s funky). For rooms? They’re all good, but our pick is definitely the Premium Courtyard Access Room. Bit pricier, but it comes with a surprisingly sunny private courtyard and a vertical garden. Nice. People often forget about Hotel Lindrum. You’ll find the boutique MGallery by Sofitel Hotel up the top of Flinders St, just near Birrarung Marr and Treasury Gardens. This ‘Paris End’ of the CBD is really underrated—the river and parks are all just a short walk away, you’ve got Flinders Lane dining just behind you (plus a few hidden gems like Eastside), and the Theatre District is only about 5-minutes’ walk away. This makes Lindrum an excellent choice if you’re catching a show at The Forum, Fortyfivedownstairs, or The Princess Theatre. The Lindrum’s 59 rooms are all pretty stunning—tastefully decorated, rather than showy. 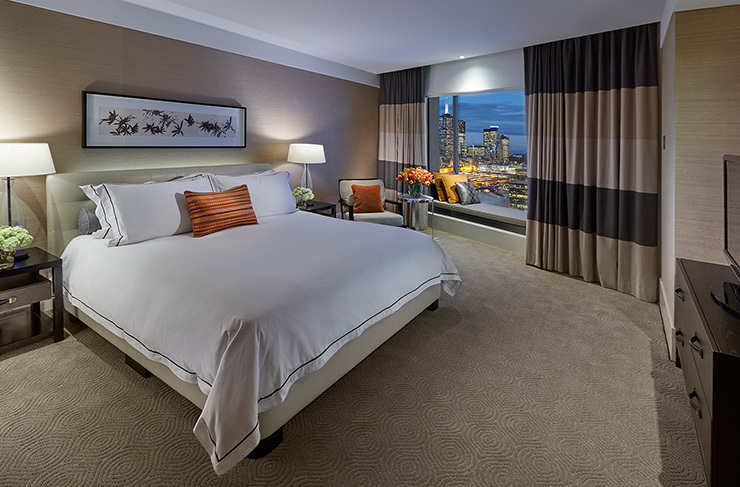 You can kick it all the way up to a Junior Suite, but to be honest the Superior Rooms are all you need for a beautiful CBD staycay. Of course The Lyall is in South Yarra. This place practically breathes leafy luxe with a side of brunch. The Lyall has 40 suites upstairs, most decked out in ‘contemporary oriental’ design. There’s literally an art gallery on each floor of the hotel, showing a range of work from local French artist Thierry B. Guests can grab a glass of bubbly in the on-site Lyall Champagne Bar, or retire for a classy meal at Bistro Lyall. There’s also a pool and gymnasium if you want to work up a quick sweat before a spot of shopping on Chapel St. And if Chapel is your game, the location is excellent. You’re a short walk from Prahran Market, high-end boutiques, not to mention some of our favourite burgers in town (hello, LA Burgers). When you’re done, pack up the backs and wander over to South Yarra Station, just nextdoor—the city is only 10 minutes away. Now that Saint Jerome’s is no longer with us (RIP), Notel is probably the quirkiest hotel in Melbourne. 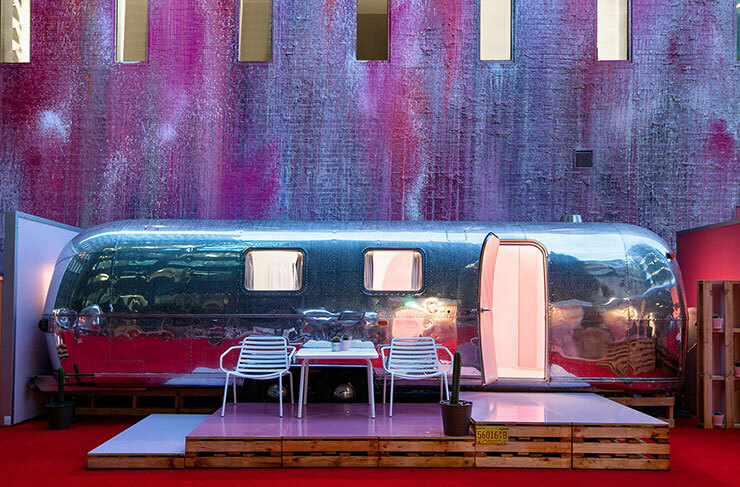 Basically, it’s a collection of six 1970s Airstream campers, converted into boutique suites, stuck on a Melbourne rooftop. 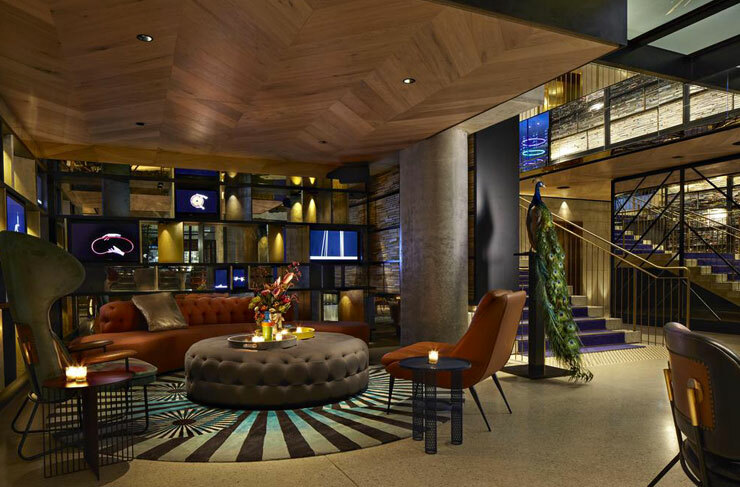 Notel is the brainchild of James Fry, who saw a gap in the local hotel market. He also owns the carpark beneath the rooftop. For years he toyed with the idea of opening a rooftop pool, but the whole campervan-hotel thing seemed like way more fun. And thus Notel was born. Your basic airstream starts at $395/night, or you can upgrade to the Airstream With Benefits for $440. 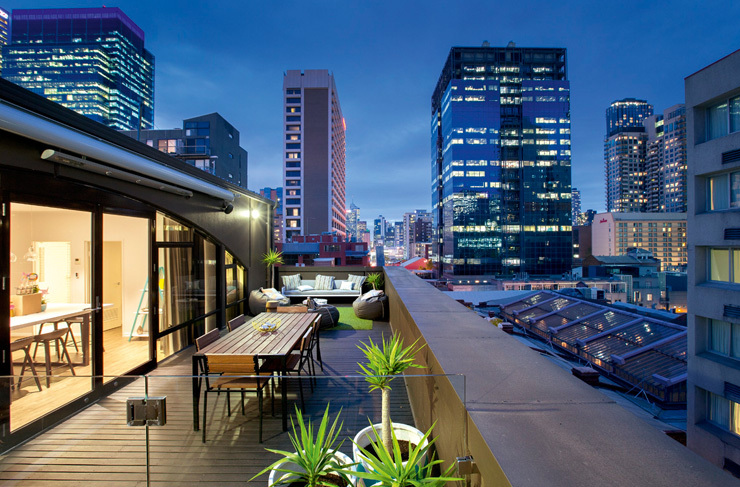 That one comes with a private deck, private spa bath and a view over Flinders Lane. All Notel caravans come with split system AC and a complimentary minibar though (winning). Feel like getting away instead? We've got Melbourne's best glamping spots right over here. Sleep tight.